Not only should you be encouraging students to participate in your class blogging efforts; you should also get parents and other family members on-board. Even today, blogging still remains a fairly foreign notion to many patents and even students themselves sometimes. Since your class blog is ultimately designed to be a collaborative effort, you’ll need to showcase the value of the medium and make sure that both your students and their parents can easily find your blog. One of the most effective ways to let parents and students know about your blog is to use the good old fashioned printed method. To create a handout promoting your blog, use a few sentences to describe your blog’s theme and purpose, provide its Web address, and outline the most important online safety rules. For best results, you should include a screenshot of your blog’s front page in the presentation. You can take a screenshot by using the PrtScn (Print Screen) button on your keyboard and pasting the screen capture into Microsoft Paint or any other image editing software. Alternatively, you can use the Snipping Tool in Windows Vista or later to capture only a specific area of the screen, and this way, you won’t need to do any further editing to remove other areas of the screen capture, such as the taskbar or other open applications. Other useful information that you may want to consider providing on the handout includes instructions on how to subscribe to the blog, leave comments, share content and navigate the website more effectively. Email subscriptions help you to keep parents and other family members informed as to what your students are learning and how your class blogging efforts are going. It also makes it easier to keep in touch, since your subscribers will be automatically alerted when new posts are published on your blog. The option to subscribe is an essential feature to have on almost any blog – not just class and student blogs. Even with free hosting, the basic WordPress platform includes a widget which you can use to add an email signup form so that visitors, such as parents and students, can follow your blog. To add the necessary widget, navigate to “Appearance > Widgets,” and open up the widget area you want to use to the right, such as “Sidebar”. 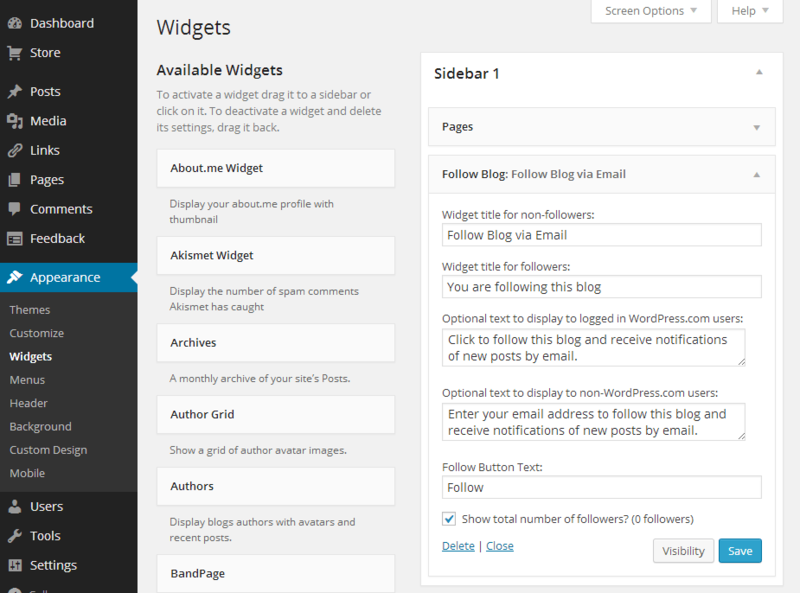 Drag the “Follow Blog” widget over from the list of available widgets to the left and drop it into the desired widget area. Click on the widget name to open up the settings, and edit the text for each field as you require, though the default entries will probably suffice. Click “Save” once you are done. A new section in the sidebar of your blog entitled “Follow Blog via Email” will appear, and visitors will simply need to click “Follow” and enter their email addresses. The subscriber will receive a confirmation email shortly afterwards. In Chapter 8, we’ll also be taking a look at how to use RSS subscriptions to aggregate newly published content for quick and convenient access.